Tutankhamun has fascinated the world ever since Howard Carter’s spectacular discovery of his treasure-filled tomb in the Valley of the Kings in 1922. 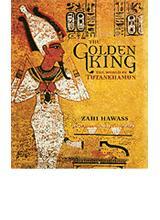 Egypt’s leading Egyptologist, Zahi Hawass, here tells the story of this golden king, a short-lived pharaoh who came to the throne of Egypt as a child and died before the age of twenty, and of the royal dynasty that bred him. The reader will meet Tutankhamun’s grandparents, the Sun King Amenhotep III and his beautiful wife Tiye, as well as the boy-king’s ‘heretic’ father, Akhenaten, his stepmother Nefertiti, and his half-sisters, the sun-kissed princesses of Amarna. Tutankhamun lived and died during one of the most fascinating periods in Egyptian history; this book provides a window into this extraordinary time of turmoil and treasure. The Golden Age of Tutankhamun is beautifully illustrated, primarily with photographs of objects from a traveling exhibit that is taking pieces from Cairo’s Egyptian Museum collections to Switzerland, Germany, and the United States. Zahi Hawass, secretary general of the Supreme Council of Antiquities in Cairo, received his Ph.D. from the University of Pennsylvania. He is the author of Hidden Treasures of Ancient Egypt: Unearthing the Masterpieces of Egyptian History (AUC Press, 2004). Your request has been completed successfully. An error has occured while processing your request.